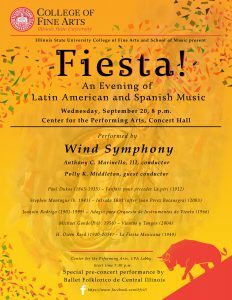 The Illinois State University Wind Symphony invites you to Fiesta! An Evening of Latin American and Spanish Music on Wednesday, September 20 at 8 p.m. in the university’s Center for the Performing Arts (CPA) Concert Hall. Tickets are $10 for general admission, $8 for ISU faculty/staff, and $6 for students and seniors. The concert features music inspired by Latin American and Spanish composers and traditional music. A special pre-concert performance by Ballet Folklorico de Central Illinois will take place in the CPA lobby at 7:30 p.m.
At the conclusion of this dance and music performance, patrons will be ushered into the concert hall while the brass fanfare, Fanfare pour preceder La péri (1912) is performed, with the new assistant director of bands and director of the Big Red Marching Machine, Polly Middleton, as guest conductor. Wind Symphony presents Fiesta! An Evening of Latin American and Spanish music. This first half of the program will feature Stephen Montague’s Intrada 1631 (2003), Joaquín Rodrigo’s Adagio para Orquesta de Instrumentos de Viento (1966) and Michael Gandolfi’s Vientos y Tangos (2004). Intrada 1631 was inspired from a Hanacpachap cussicuinin, a 17th century Catholic liturgical chant written in Quechua, the native language of the Incas. The music was composed by a Franciscan missionary priest named Juan Pérez Bocanegra, who lived and worked in Cuzco (Peru), a small village east of Lima in the Jauja Valley. “This piece is incredibly moving and ends in a grand fashion with the use of organ played by Bloomington community member, Doug Salokar, along with some other surprise elements,” stated Wind Symphony conductor and new Director of Bands, Anthony Marinello. Composed for the American Wind Symphony in 1966, Adagio para Orquesta de Instrumentos de Viento creates a picturesque Spanish ambiance, full of color and delightful melody. Commissioned by The Frank L. Battisti 70th Birthday Commission Project and dedicated to Battisti in recognition for his immense contributions to the advancement of concert wind literature, the various instrumental combinations of Vientos y Tangos (Winds and Tangos) are inspired by the traditional sounds of the bandoneon, violin, piano, and contrabass. This concert will be the first Wind Symphony concert conducted by, Marinello. In addition to serving as Director of ISU bands, Marinello is the conductor and music director for the ISU Wind Symphony and Symphonic Winds, he leads the graduate wind conducting program, and teaches courses in instrumental conducting. Anthony Marinello joins ISU as new Director of Bands. 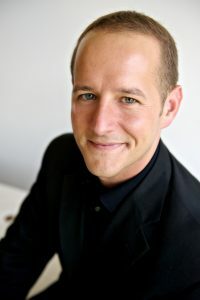 He joins the faculty at Illinois State University from the University of Texas at Austin, where he is currently completing the Doctor of Musical Arts degree in wind conducting. Previous to his appointment at ISU, Marinello has served on the faculty of the University of Texas at Austin and Virginia Tech and taught in the public schools of Louisiana, Ohio, and Texas. For a schedule of upcoming band concerts and events visit the Bands homepage on the College of Fine Arts website and follow Illinois State University Bands on Facebook. Tickets can be purchased at the Illinois State University Center for the Performing Arts box office, or by phone at (309) 438-2535. Tickets are also available through ticketmaster.com. Performance parking is available for free in spots 250 and above at the School Street Parking Deck, 400 W. Beaufort St., in Normal.